Posted on Fri, Apr 20, 2012 : 5:59 a.m.
Ellen Lynch personifies the "Three Ps": patience, persistence and perseverance. Ellen and her husband Chris called me in to assist them in getting their new rescue dog, Peanut, acclimated to their home. Ellen was concerned about Peanut not sleeping in her crate through the night. Ellen was up with Peanut many times during the night, and that is exhausting. Peanut would go into her crate but did not adjust well to the door being closed. We solved this by having the crate next to Ellen during the night with a leash attached to Peanut. (The crate door was temporarily left open). This way, in the middle of the night when Peanut was restless and semi-woke Ellen, all Ellen did was remind Peanut with a touch to the leash to get back into her crate. Peanut did not have to "go to the bathroom" in the middle of the night — she was just anxious. Next concern: how to get Peanut used to dogs in the neighborhood without being aggressive toward them. We worked on getting Peanut used to other dogs by going for walks with the other dogs — not by introducing the dogs through the fence. Next, and timing is so important here, Ellen began to recognize when Peanut was getting ready to act aggressively, and she was able to correct Peanut's behavior before the aggression began. This a very difficult step and one that asks a lot of the person at the end of the leash. If we are talking on the phone or listening to our iPod rather than being attuned to our dog's behavior, a number of situations can arise — most of which are not very pleasant. These are examples of patience and persistence. Months went by and Peanut’s behavior resolved. The crate became a non-issue. Closing the door to the crate? Check that off the list. Barking at other dogs on the walk? No more. A few months later I heard from Ellen again — when Peanut started something new. Peanut began to bark at Ellen’s husband Chris when he came home from work. What? Yes, Peanut had become so confident, thanks to Ellen’s patience and persistence, that she now believed herself to be in charge of the house. Peanut needed a gentle reminder as to who was pack leader of this house! When a dog is pack leader, the balance of the human-dog pack is upside down. Dogs are hardwired to be deferential to a leader. Unwanted behaviors arise from a dog if the dog is allowed to be in charge of the home: barking at the human, biting the human, growling at the human. Well someone has to keep the human in line! A dog relaxes and is most comfortable when it does not have to make decisions it is not by nature expected to make. No dog, however big or small, can run a house. Many people tell me, "I am the leader at work. But I can't control my dog." What counts to your dog is the calm assertive — NOT aggressive — energy you convey to them. No dog is going to follow an unstable pack leader. Try this experiment. When you come home from work, call out to your dog in an excited high-pitched voice. Run to the dog's crate and let the dog bound out jumping up at you. Hug and kiss the dog. Clean up the pee — yes, the dog has just peed as you are squealing and hugging it. Then you push the dog away — you’ve had enough jumping — but your dog thinks this is play time and nips at your hands and pulls at your clothes. Now experiment with the this new form of greeting when you come home. Walk in the door. Do not greet your dog. Put your coat away. Ignore the whining and crying from your dog. Go through your mail. Notice how quiet it has become. At this point, calmly walk to the crate. Open the door, but do not let your dog shoot out of the crate like it has been shot out of a cannon. Ignore your dog. You ask the dog to sit. Now is the time to pet your dog. Reward the calm behavior by calm, slow petting — not roughhousing and not with a high pitched, excited voice. What are Ellen’s latest goals? 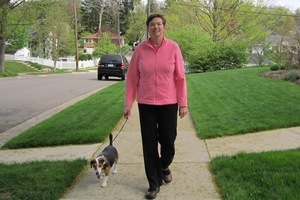 Ellen began walking Peanut in a prong collar. Peanut is now ready for a slip collar. Ellen is now ready to introduce another dog into the household as all of the less-than-constructive old behaviors have been eliminated. It is easier to introduce a second dog — as many of you agree — as the second dog learns the new routine/behaviors from the first dog. Ellen and her family have practiced patience, persistence, and most of all perseverance, truly the most admirable qualities any human can possess. Peanut gives them two paws up!